Your little guinea pig is vulnerable to various respiratory illnesses and infections. Because of sensitivity to many antibiotics, the standard treatment for bacterial infections might not work for your cavy. Take your pet to the vet at the first sign of any respiratory problem. Prompt treatment can save his life. According to The Merck Manual for Pet Health, pneumonia is the number-one cause of death in guinea pigs. Symptoms include breathing difficulties, nasal discharge, appetite loss, fever, sneezing and conjunctivitis, the eye inflammation also known as pinkeye. Your vet might administer oxygen to your pet to help him breathe, along with vitamin C. If tests reveal a bacterial infection, your vet will prescribe antibiotics, but if your pet experiences diarrhea from the medication he has to stop receiving it. Separate a sick guinea pig from any other cavies in your household. The adenovirus specifically affects guinea pigs. While many cavies carry it and never come down with illness, stressful situations can cause long-time carriers to develop symptoms. Symptoms include labored breathing, nasal discharge and loss of weight and appetite. While it's not usually fatal, animals who do die from adenovirus often appeared asymptomatic and just drop dead. In dogs and cats, Bordetella bronchisepta causes the disease colloquially referred to as "kennel cough." As in other animals, Bordetella bronchisepta is very contagious. 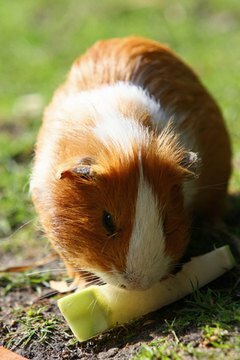 Guinea pigs can pick it up from other pets who sneeze or cough out infectious droplets. While it's usually just an irritant to your cat or dog, it's often fatal in guinea pigs. Ask your vet about vaccinating your guinea pig against this disease, especially if he shares the house with dogs and cats often kept at boarding facilities, or if you board out your guinea pig when you travel. The form of pneumonia caused by Streptococcus pneumoniae usually occurs only when guinea pigs are very stressed or suffering from malnutrition. Guinea pigs with this disease experience difficulty breathing, along with swollen lymph nodes. Other symptoms include inner ear infections. Your vet can prescribe antibiotics that might enable your pet to survive. Some respiratory problems result from allergies. If your pig appears to have a stuffed-up nose but no wheezing in his lungs, it could be something in his environment that's causing the problem. If it's pollen season, that could affect him just as it does many people. He might also react to the type of bedding you put in his cage. Try changing to a different type, such as timothy hay, and see if it makes a difference. Your vet might recommend various treatments after diagnosing the allergy's cause.